Embarking on this Vegan journey, there has been one thing I LOVE and miss, but wreaks havoc on my body. That is none other than ice-cream. My favorite is Butter Pecan, which makes me weak in the knees. I’ve been searching for a nice Vegan Ice Cream to purchase, and there are now a few on the market. However, those pint size servings are not cheap and the flavors are not always ones that I like. I figured why not try to make my own….but how? In searching, I came across some interesting recipes, but many of them required ingredients that I didn’t want to use, one being oils like Coconut or others. Concerned about the fat content as well, I wanted it to be more healthy, and not require so many ingredients. There were those that looked good, but the texture was more like liquid. Then there were those that had a similar texture to ice Cream, but had way to much going on and didn’t have a good taste. So, I gave up. Then a friend of mine invited me over to learn how to make a super simple Vegan Ice-cream that only has 4 ingredients + water and required no oil at all. She had a very nice Ice Cream maker, which was great because I didn’t own one and they are pretty expensive. I’ll explain later how in my own attempt to make it at home, I overcame that challenge and saved some major bucks! Step 1 – The original recipe called for blending the cashes until made into a powder, but I found the texture was a bit too gritty for me. So, I placed all ingredients in a blender (VitaMix works AMAZING). Blended until everything is liquified. Step 2 – Remove Ice Cream maker container from the freezer and place in the base of the machine. The inside stir paddle will need to be placed inside of the container as well. Then pour your liquid mixture into the container. (Follow the instructions on your particular Ice Cream maker). Turn on and watch the liquid turn into ice Cream. After a while you should see this liquid forming into an Ice Cream texture. Once it all forms and begins to clump together, you may want to take spatula and push it back down until it is the consistency you want. Here was my finished product and I LOVED IT! It looked, smelled and tasted amazing!!! I added some fresh pecans to give it that extra something. This particular flavor was Vanilla Maple Pecan. If you are looking for an alternative to dairy ice-cream, and want to save some cash, I suggest trying this simple recipe. You’ll love it! 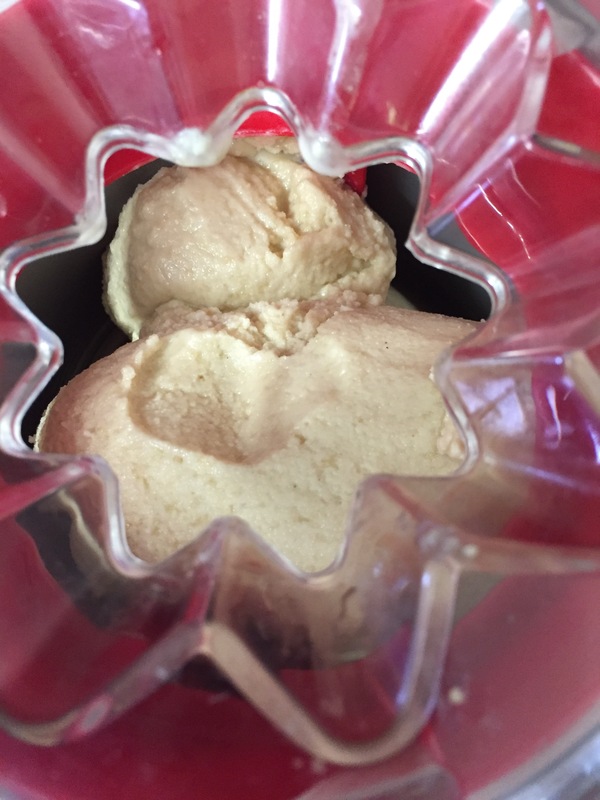 Keep a look out for Part 2 of this Blog, as I share with you how I was able to snag a pretty cheap version of an Ice Cream maker and made excellent Ice Cream!